The prayer request portion of Sunday school class is the reason why we never seem to get much Sunday schooling done. And that’s not a knock against me or anyone else there. We have a fine class, a fine teacher, and a fine time probing the depths of the Good Book. Secretly, though, I suspect many of us spend most of that first half hour of class fidgeting and sighing so we can get to the good part. The part that, whether stated or not, means a little more. A few Sundays ago the teacher wrapped up his lesson early, allowing those so inclined a full twenty minutes to spill their guts and tell everyone the happenings in the days of their lives. Hands shot up. The teacher would call a name or nod to a person, going one by one through the room and taking notes, which would be distributed the next week on our official prayer request sheets. Yes. We take this seriously. Our space was then transformed from classroom to confessional as secret pains and worries were flung out into the light to be prodded and prayed over. The lady two seats down from me was the first to raise her hand but not to be chosen. She lowered her hand and waited her turn. The one chosen began to speak on soft and muffled words of the tests she was to get in the coming week that would reveal whether she had cancer or not. A couple near the front had just learned they were going to be parents. It was their fourth try, they said. The first three pregnancies had resulted in miscarriages. One man was losing his job. Another man was still looking for one. One woman said her teenage son came home drunk two nights before and threatened her. She’d been staying with her sister since, afraid to go home. A mother and father had a son who’d just been given his traveling orders for Afghanistan. “Pray he shoots straight and ducks,” the father said. Another couple had a friend who’s son had just come home from Iraq. The funeral would be the next day. A car accident had taken the life of a seventeen-year-old son of a preacher in the next town. A woman buckled under the grief of a marriage in tatters. And through it all, the woman two seats down would raise her hand and wait her turn, lowering it when the Sunday school teacher had called upon someone else, scribbling both name and note on the paper. After ten minutes, her hand went into the air slower and with a little more hesitation. After fifteen, her hand wasn’t raised at all. I found her in the hallway afterward and said hello. Then I mentioned the lack of time and the abundance of prayer requests in class, and that it was a shame she never got to share hers. She looked at me and offered a small smile. I nodded again. I understood, I really did. But she was wrong. She was called away before I could tell her what I was thinking. What I thought she really needed to hear. She’s right, of course. There are so many hurting now, and for so many reasons. But I for one believe that doesn’t mean one person’s problems are greater than another’s. Not to God. 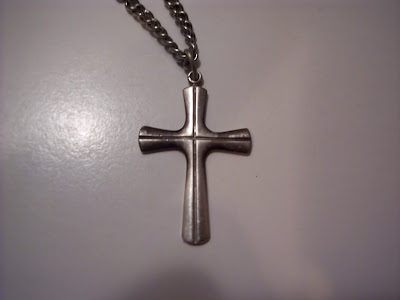 To God, at that moment the only thing in the universe that mattered was that she had lost her necklace. Just like the only thing in the universe that mattered was one son going to war and another coming home, and a family dissolving, and a car accident, and a threatened mother. Humility is an important thing to feel. We need to know the world doesn’t revolve around us. But the love of God is an important thing to feel, too. And we also need to know that.